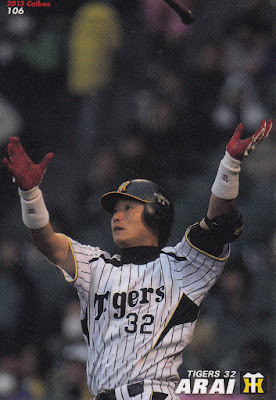 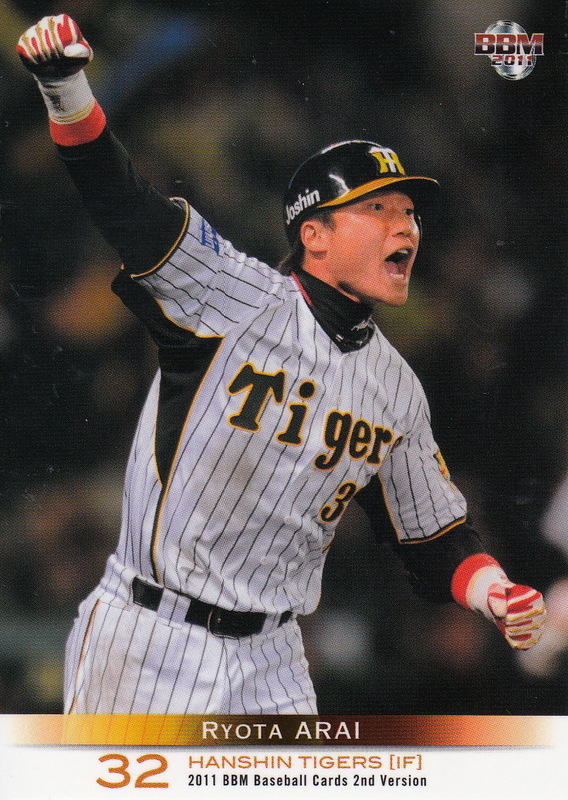 Ryota Arai of the Tigers is another player who retired at the end of the past season. 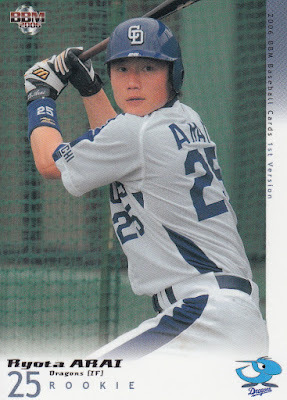 Arai was the fourth round pick of the Chunichi Dragons in the fall 2005 draft out of Komazawa University (which is also the alma mater of his brother Takahiro). He debuted with the ichi-gun Dragons in the summer of 2006 and was a part time player with them through 2010. 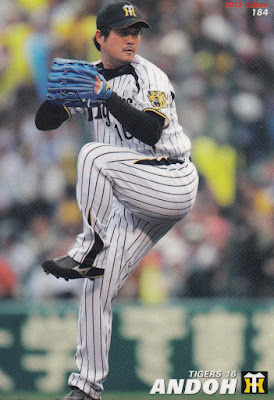 He got traded to the Hanshin Tigers in the 2010-11 off season for Keisuke Mizuta which allowed him to become a teammate of his brother Takahiro. 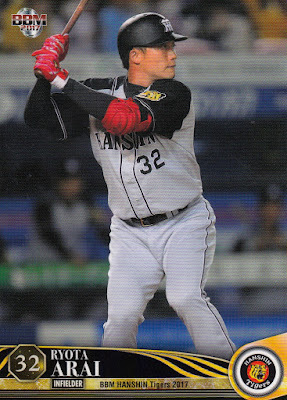 He had really his only two seasons as a regular in 2012 and 2013 - he hit .280 with 11 home runs in 110 games in 2012 and .238 with 14 home runs in 119 games in 2013. His playing time with the top team dropped off after that due to injuries and poor performance. 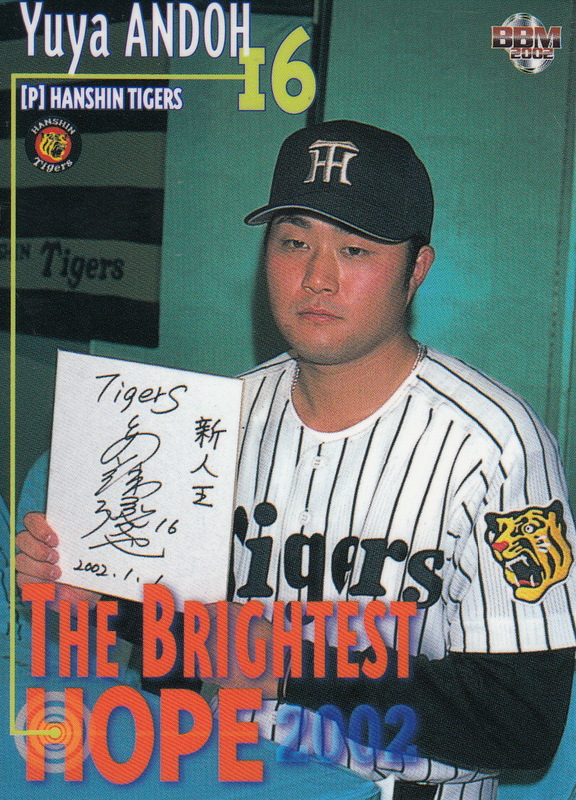 He played in two Nippon Series - winning in 2007 with the Dragons and losing in 2014 with the Tigers. His BBM rookie cards are #64 in the 2006 Rookie Edition set and #284 in the 2006 1st Version set. His first Calbee card didn't appear until 2013 (#106). 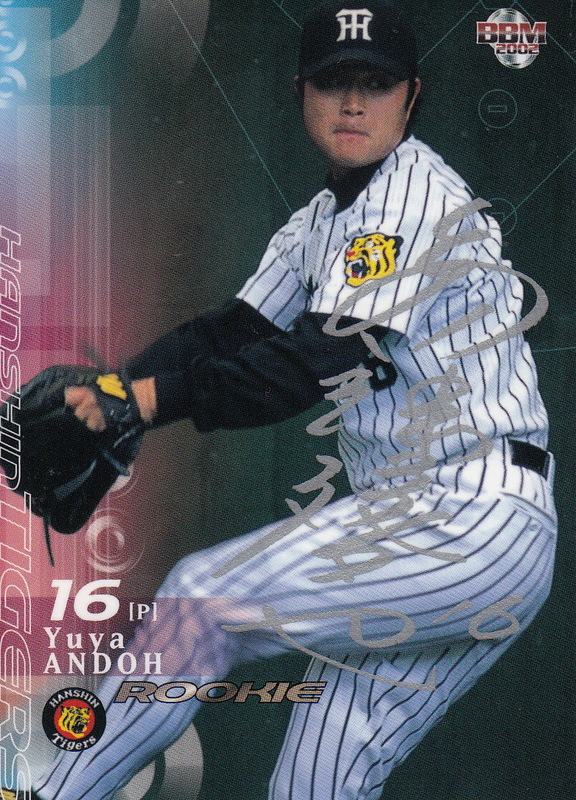 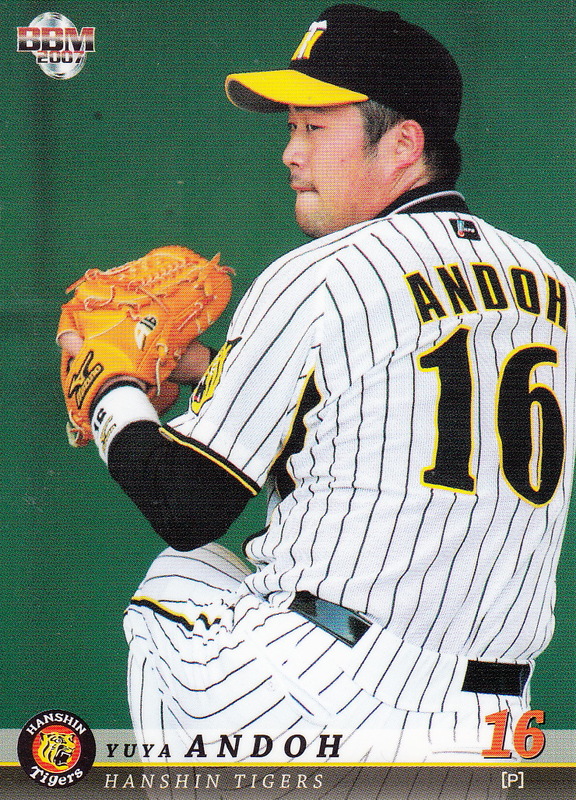 Longtime Hanshin Tigers pitcher Yuya Andoh announced his retirement back in the middle of September. Andoh attended Hosei University of the Tokyo Big Six League and then joined Toyota's industrial league team after he graduated. 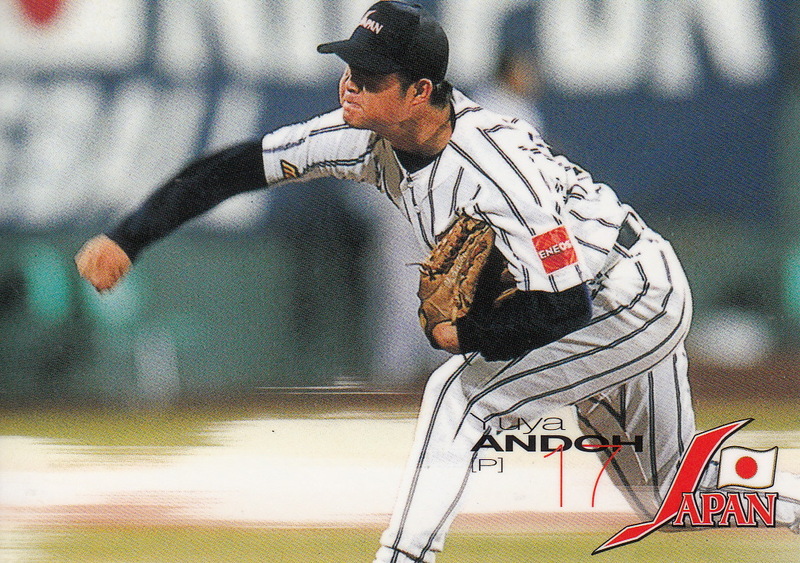 He was a member of the Japan National Team for the 2001 Baseball World Cup and was drafted by the Tigers (in the "free player acquisition" round) the day after the tournament ended. 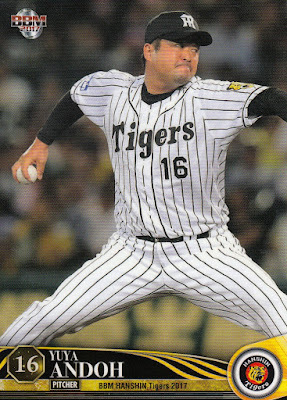 He debuted with the Tigers in April of 2002 and worked out of the bullpen his first few years with the team. 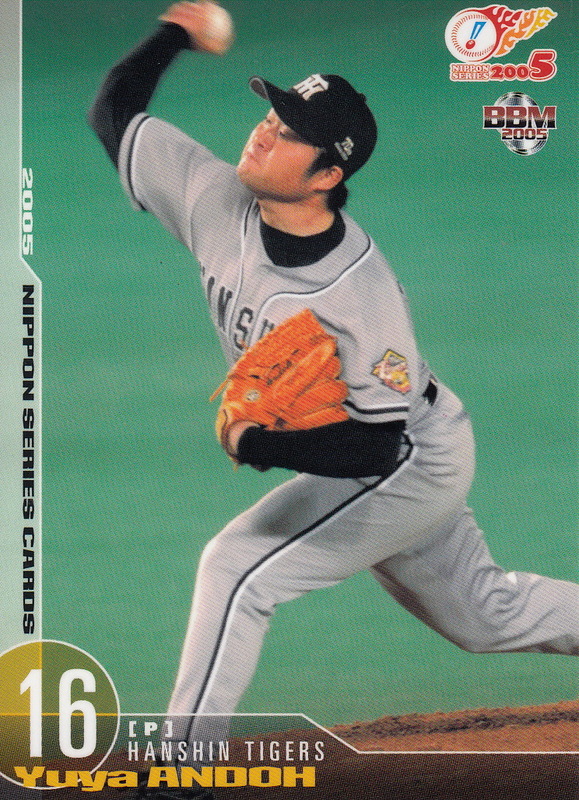 He moved to the starting rotation in 2005 and remained there for most of the next eight years although he missed significant time in 2007 and 2011 with injuries. 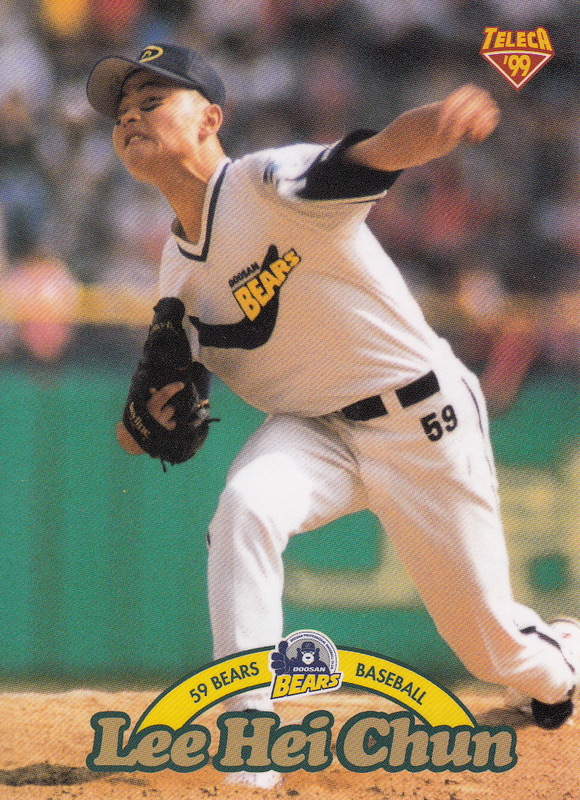 He moved back into the bullpen in 2013 and got into at least 50 games a year for the next four seasons in a middle relief role. 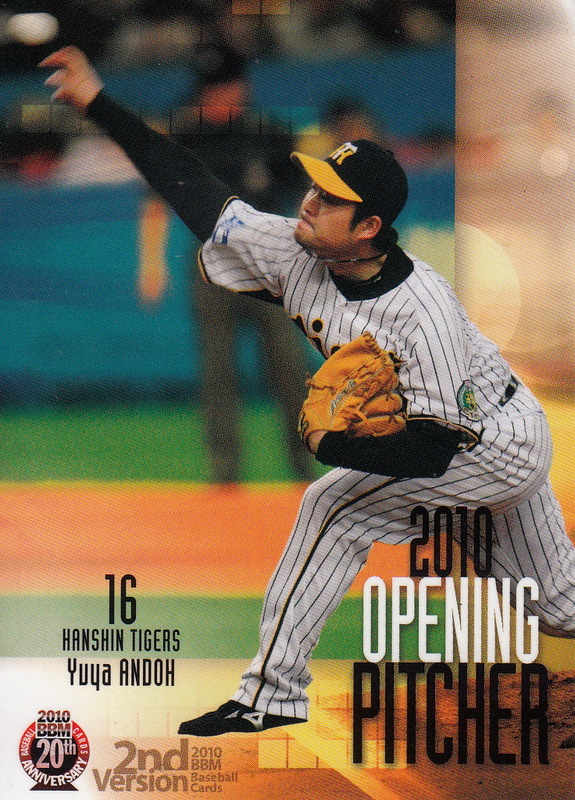 He spent almost all of 2017 with the Tigers' farm team however - I'm not completely sure why but I think it had more to do with the Tigers preferring to use younger pitchers at the ichi-gun level than Andoh's performance. 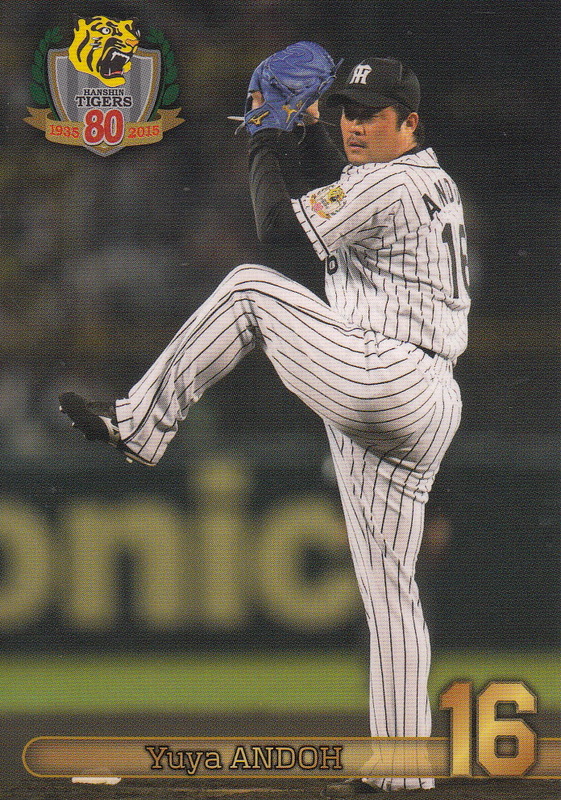 He played in three Nippon Series with the Tigers - 2003, 2005 and 2014. He suited up for the Japan National Team three times as well - the aforementioned 2001 Baseball World Cup, the 2003 Asia Championship and the 2004 Olympics. 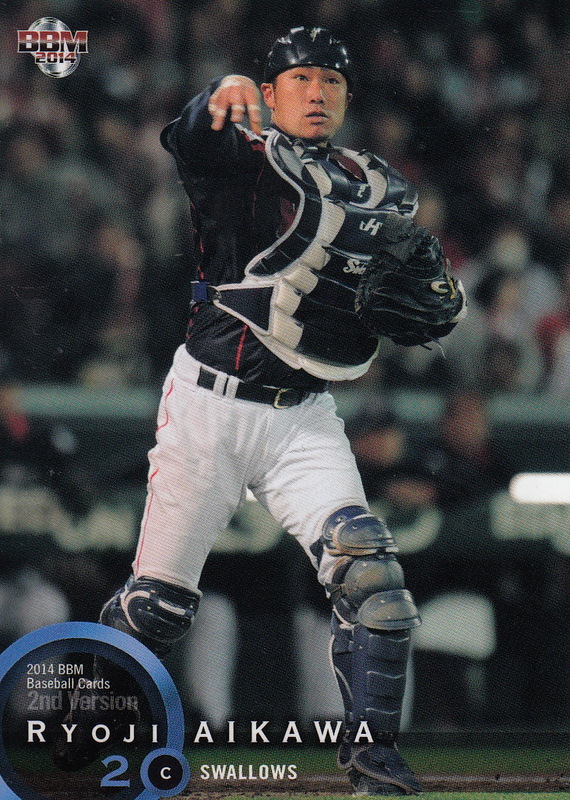 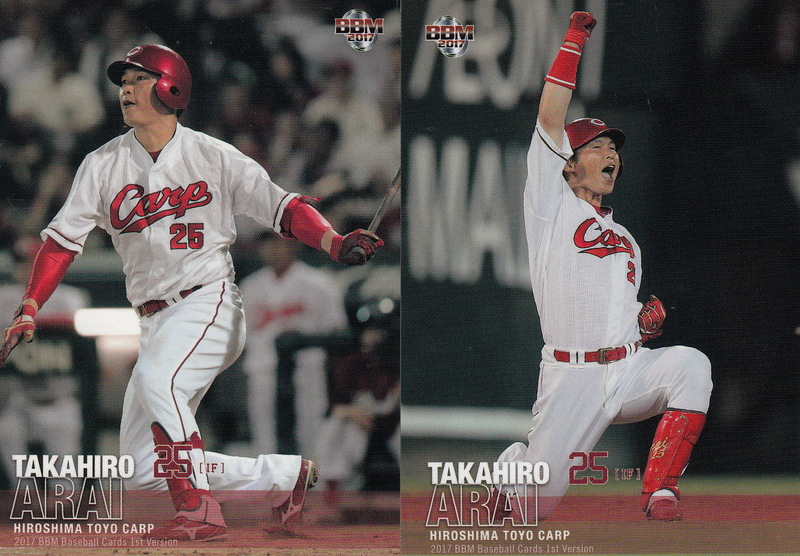 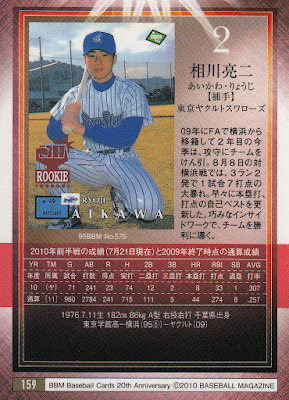 Because he was still an amateur when he played in the 2001 Baseball World Cup he's one of the few Japanese players to have a "pre-rookie" card as he appeared in the 2002 BBM set for the Japanese team in that tournament. 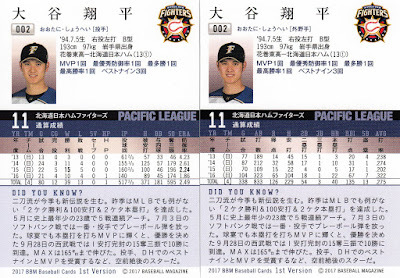 His first NPB cards are a draft pick card in the 2002 BBM Preview set (#P60) and a card in the 2002 BBM 1st Version set (#173). 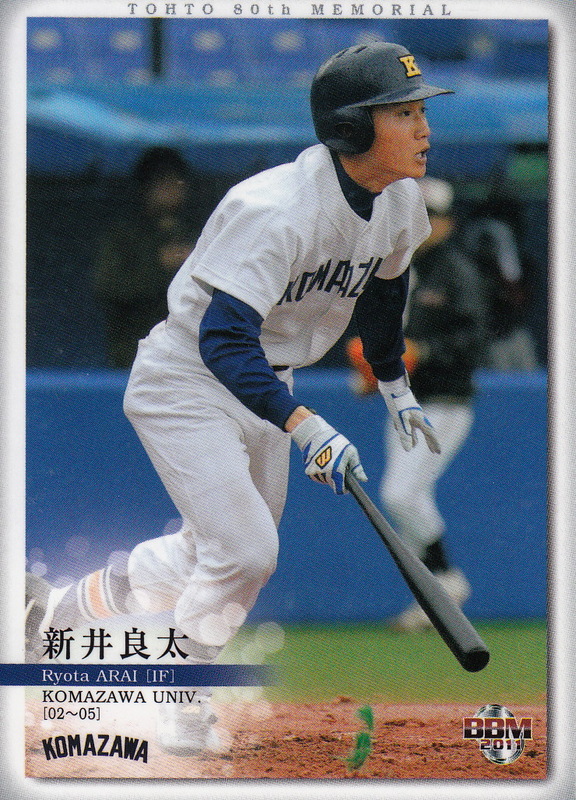 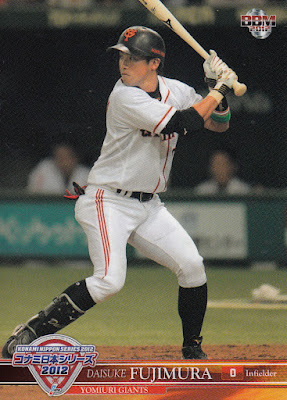 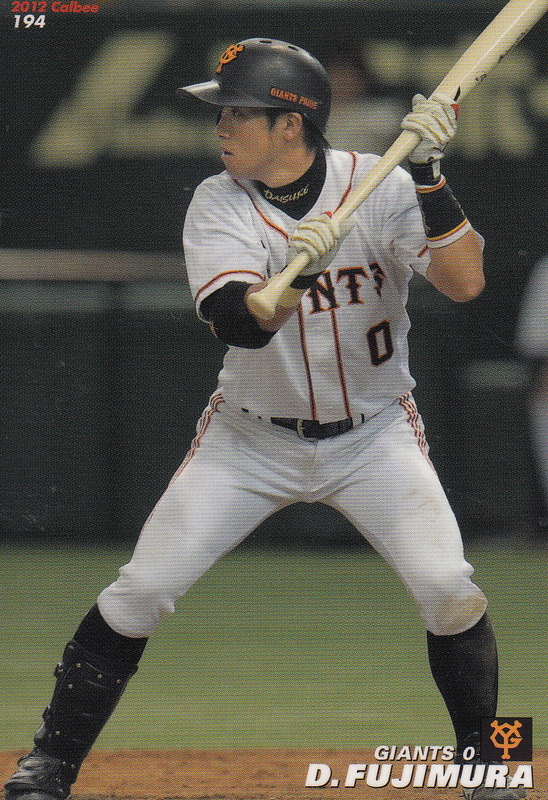 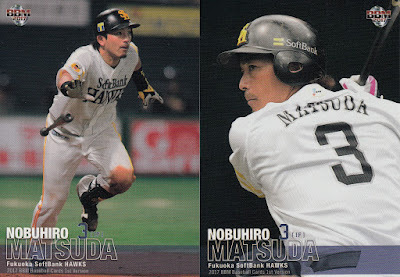 His first Calbee card was #039 in the 2004 set. I was looking at the box score from the Melbourne Aces' 6-0 shutout over the Adelaide Bite in the Australian Baseball League on Friday when I realized that the starting pitcher for the Aces was Korean pitcher Hei-Chun Lee who I had not included in my list of Asian players in the ABL this season. 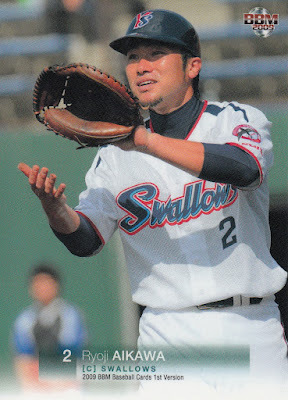 I think that the reason I missed him is that Melbourne added him to the roster after the first week of the season. 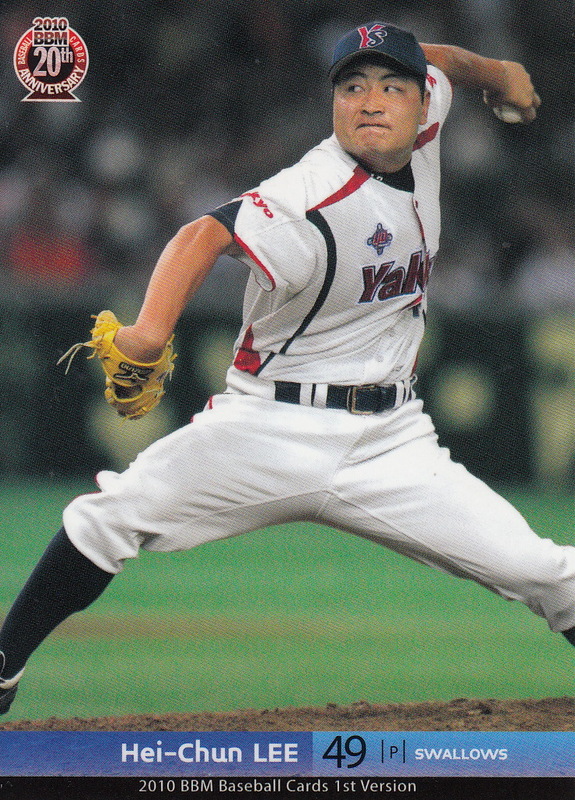 Lee is a veteran of both the KBO and NPB. He was originally drafted by the then OB Bears out of high school back in 1998 and played for the Bears (who were bought by Doosan in 1999) until 2008. He left the KBO as a free agent and went to NPB where he spent the next two seasons playing for the Tokyo Yakult Swallows. 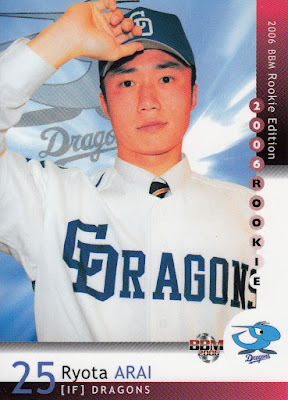 After the 2010 season he returned to Korea, spending three more seasons with Doosan (2011-13) and two with the NC Dinos (2014-15). 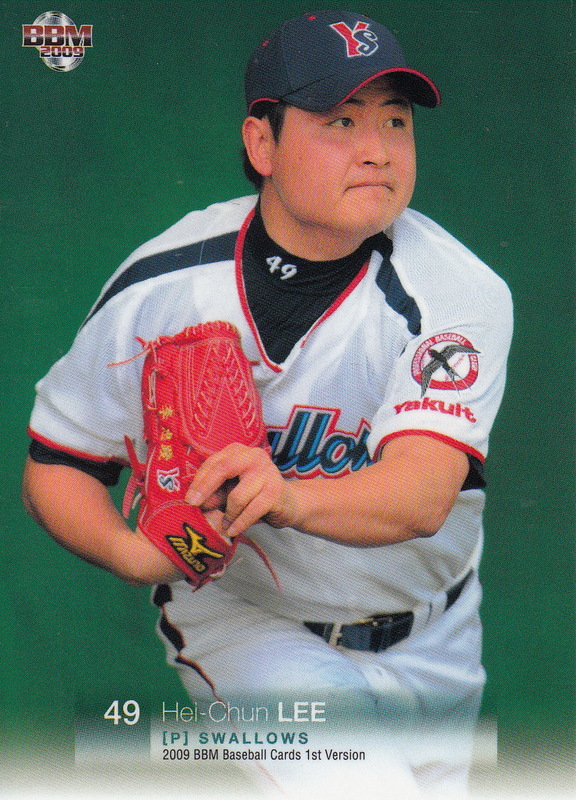 I'm not sure where he's played the past two seasons although he pitched for Adelaide in the 2016-17 ABL season. 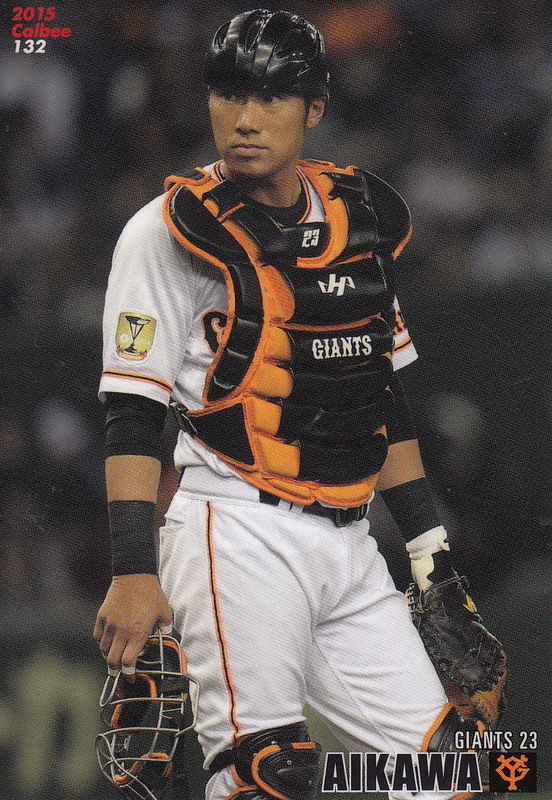 Another 2017 retiree is catcher Ryoji Aikawa of the Giants. 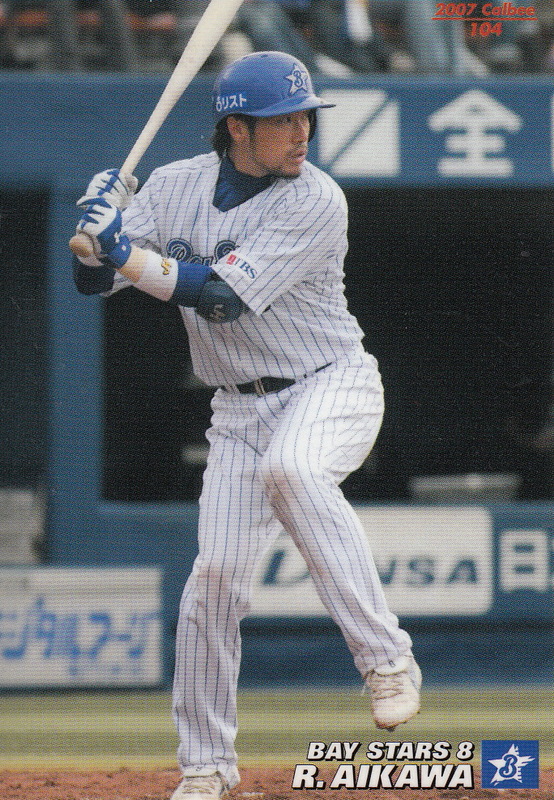 Aikawa was originally drafted out of Tokyo Gakakan High School in the fifth round of the fall 1994 draft by the Yokohama Baystars. He spent the first four and half years of his career with the Baystars farm team as he didn't make his ichi-gun debut until August of 1999. 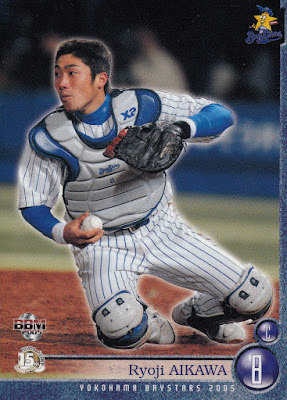 He was Yokohama's backup catcher for a couple of years before moving into the starting role in 2004. He remained in that role for them for the next five years until he left the team as a free agent after the 2008 season. He joined the Tokyo Yakult Swallows and was their starting catcher for them until he got injured in 2012 and lost the starting position to Yuhei Nakamura. He became a free agent again after the 2014 season and moved a couple miles to the east to the Tokyo Dome and the Yomiuri Giants. 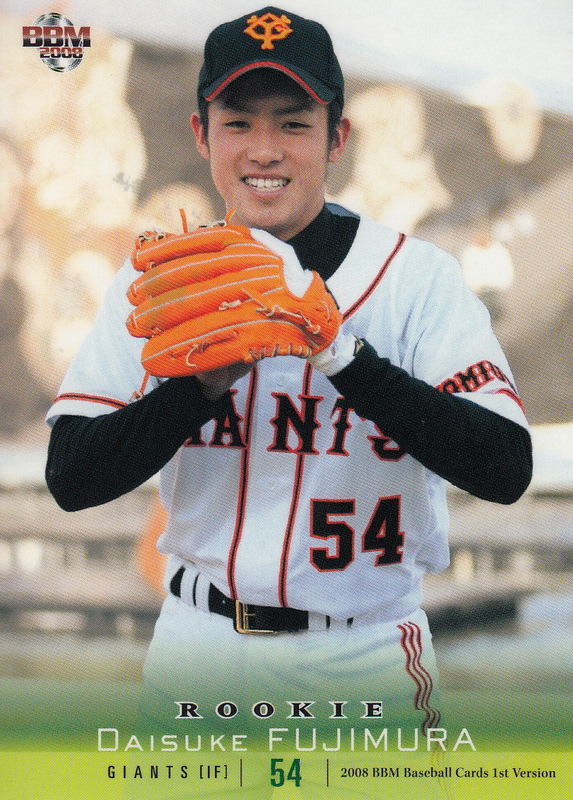 He spent his three seasons with the Giants as backup to Seiji Kobayashi. 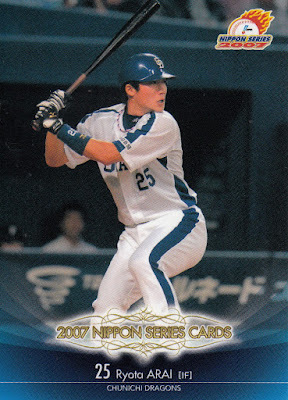 He was a five time All Star (2007, 2009-12) and played for the Japan National Team on three occasions - the 2004 Olympics and the 2006 and 2013 World Baseball Classics. 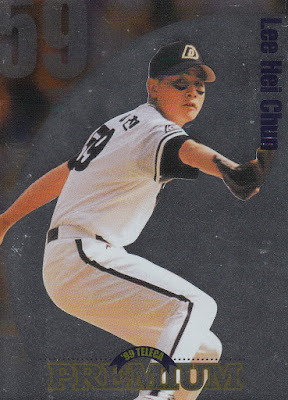 His rookie card was #575 in the 1995 set. 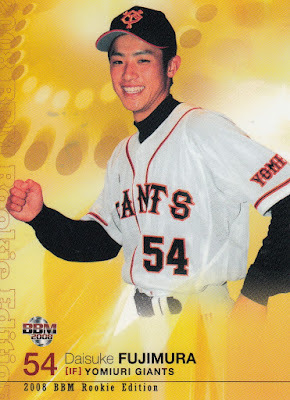 He didn't have another card in a BBM flagship set until 2001. His first Calbee card was not until 2005 (#153). 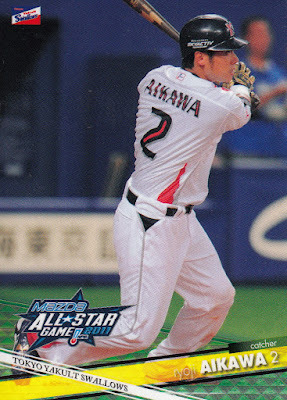 Despite playing for Team Japan three times I don't believe there are any cards showing him with the National Team. BBM had a new gimmick with their sets this year - secret versions of cards. 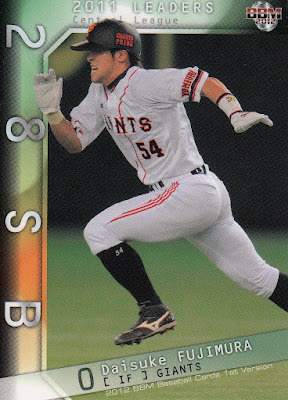 What's a secret version of a card? 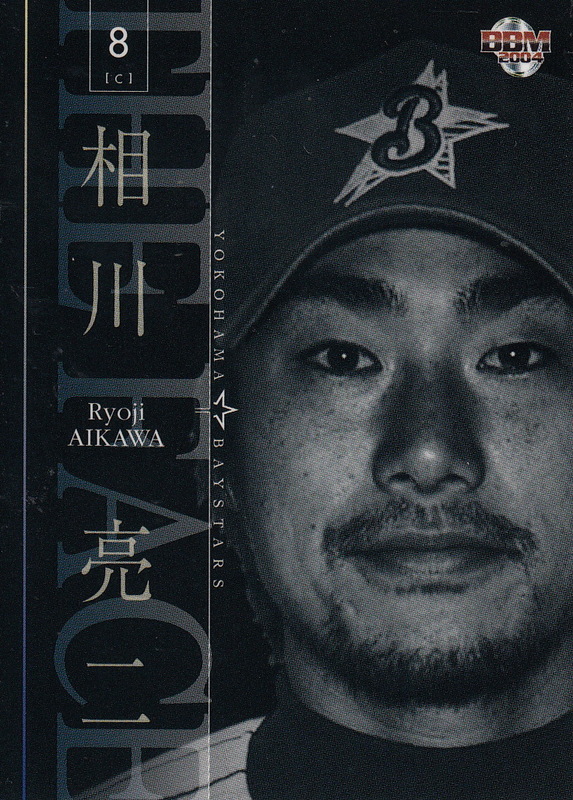 It's a short printed alternate version. 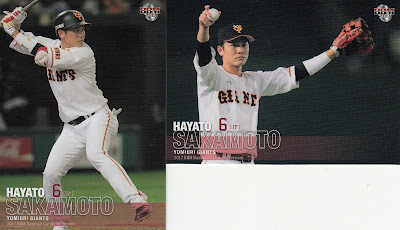 This is similar I guess to something that Topps has been doing for a number of years but it's a first for Japanese cards. 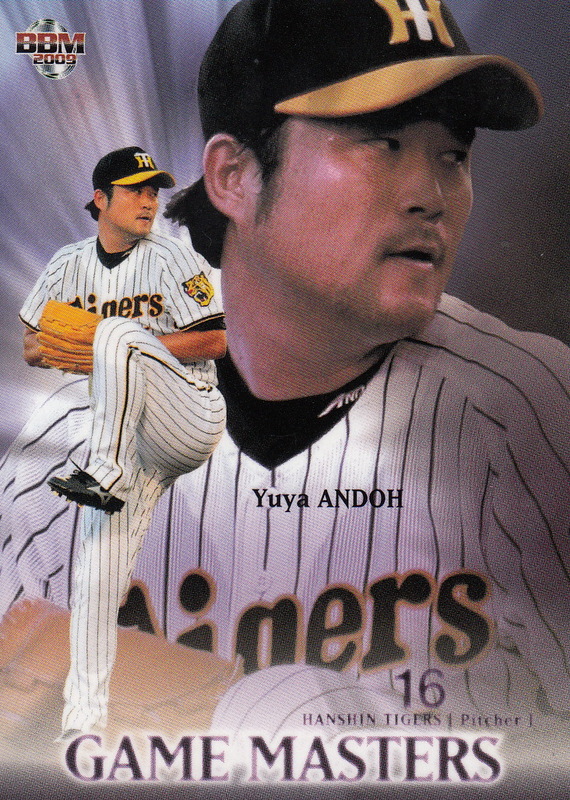 Well I say it's a first but BBM has kind of done something similar to this previously. 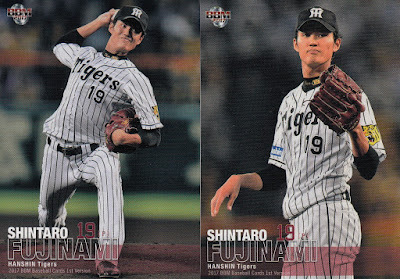 The 2013 Rookie Edition and Fighters sets and the 2014 1st Version set each had two cards of Shohei Ohtani that shared the same number. However neither card was short printed and both cards were considered part of the base set. 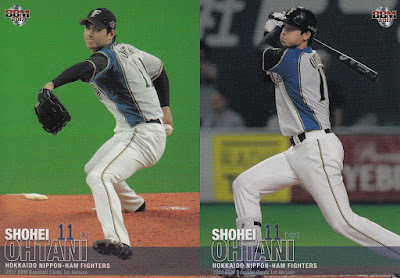 So there are two questions that these raise for me. 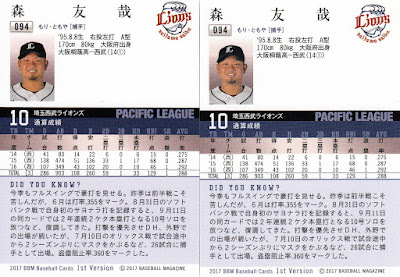 The first one is how do I know which cards have secret versions and the second one is how do I know which card is the secret version? 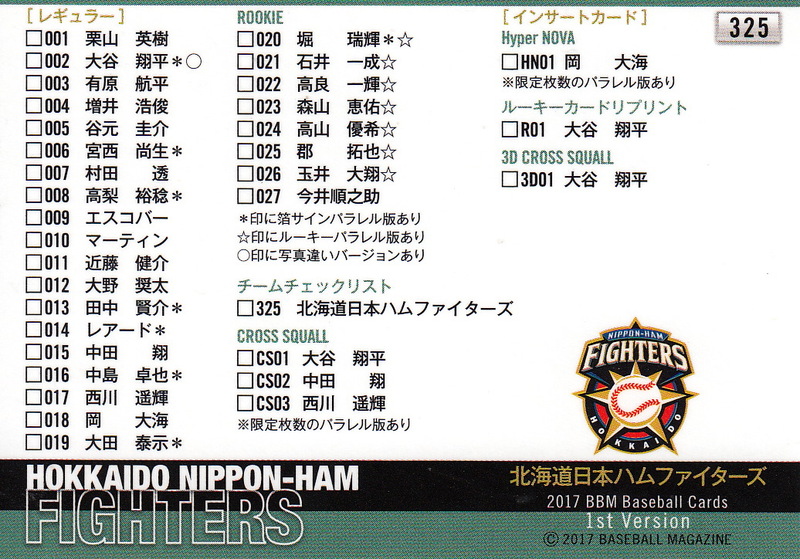 The empty circle next to the listing for card #002 (Ohtani) indicates that this card has a secret version. 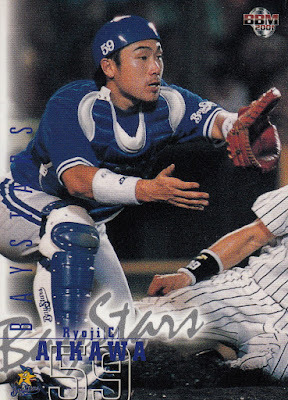 (And just for completeness the "*" indicates that the card has signature parallel versions and the stars indicate that the rookie card has a parallel as well.) 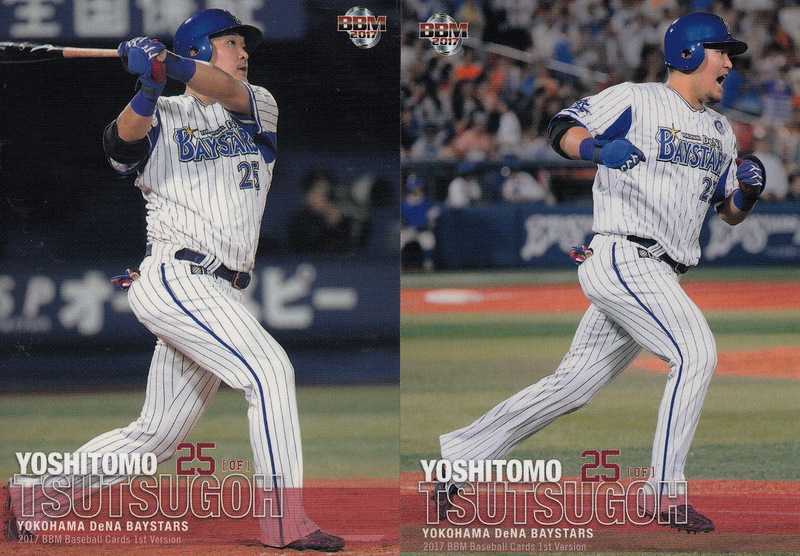 I believe that the secret versions can have same plethora of signature parallels as the regular cards. 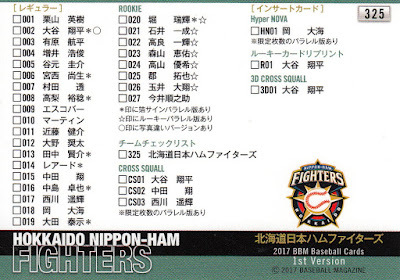 For the second question...I have no idea. When Epoch took this concept and went nuts with it for their team sets last summer they added one or more stars on the back of each of the variants to clearly indicate if the card was a variant or not. It doesn't look like BBM did anything like that, at least not for the 1st Version set. 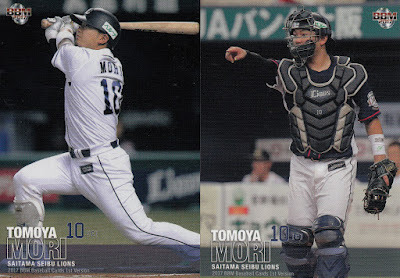 Here's the backs of Tomoya Mori's cards - I can't see any difference. 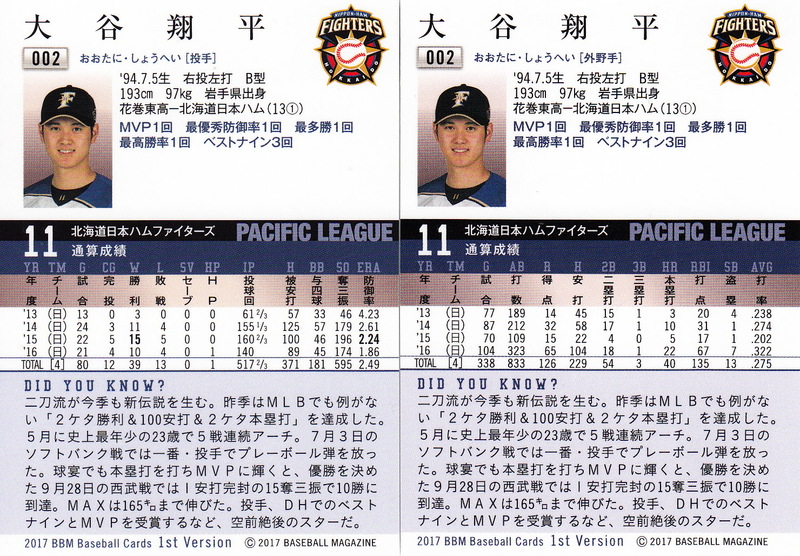 BBM issued secret versions for 14 cards in their 2nd Version set in August - one player for each team plus Ami Imamura's "Ceremonial First Pitch" card and the Marines team card (the normal version shows the Marines' main mascot Mar-Kun while the secret version shows their new lantern fish one). 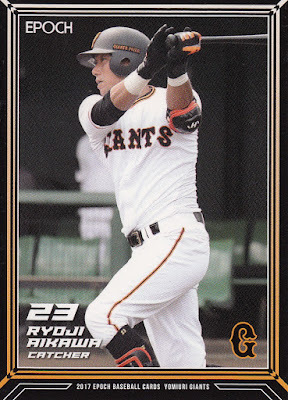 The just released Fusion set has secret versions for nine cards - five OB players and four active ones (including Ohtani and Hayato Sakamoto). 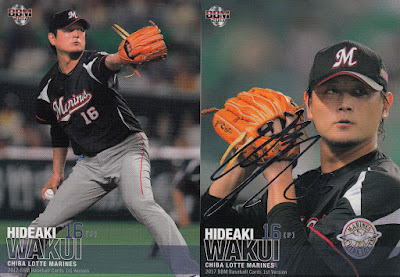 The secret versions have been kind of fun I'm a bit nervous on how BBM's going to handle this going forward. 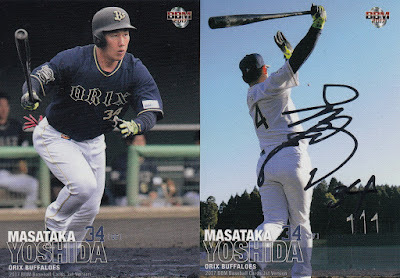 I worry that they're going to decide that more is better and go complete overboard like Epoch did last summer (and like Topps apparently has). 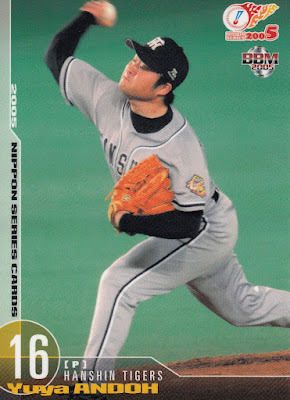 A handful of cards with secret versions is fun and doable - a large number is frustrating and impossible. Giants infielder Daisuke Fujimura is another player who retired at the end of the season. 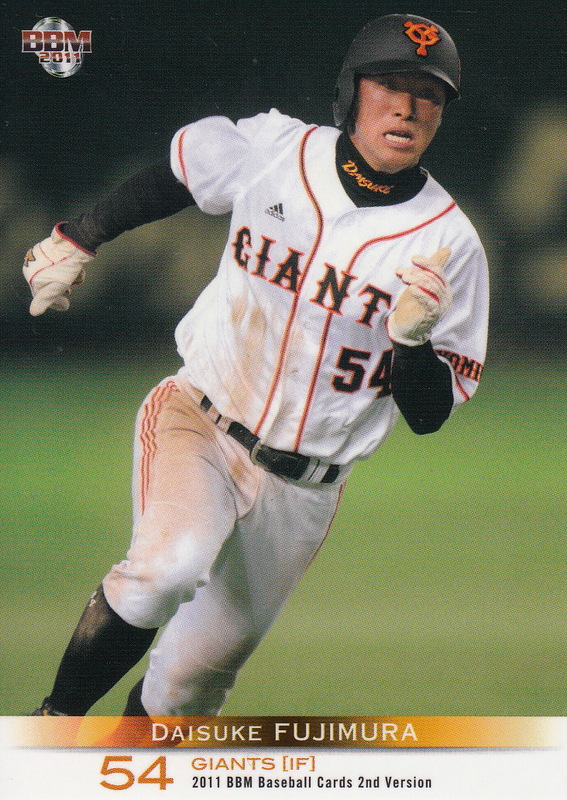 Fujimura was the Giants' first pick in the 2007 high school draft out of Kumamoto Industrial High School. He spent his first three seasons exclusively with their farm team. 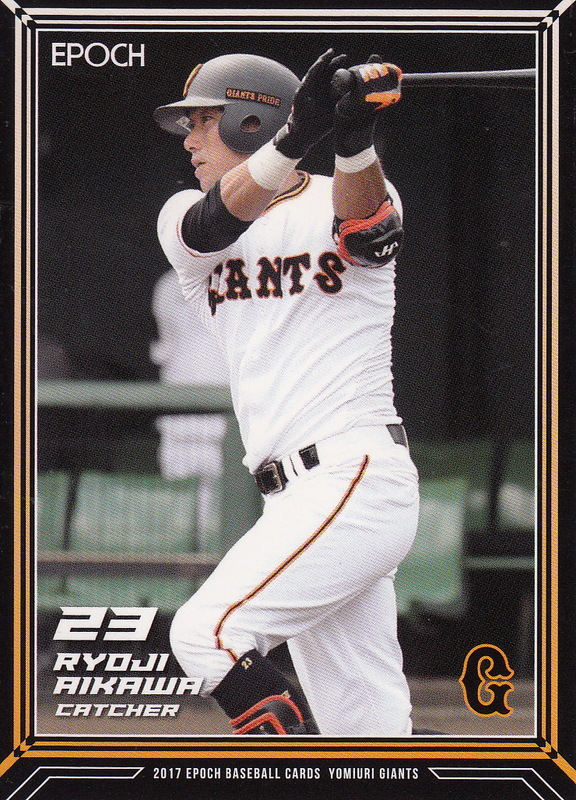 He made his debut with the ichi-gun Giants on May 10, 2011 and he made the most of his rookie season - he got into 119 games and lead the Central League with 28 steals despite only hitting .222. That was probably the highlight of his career - he never got into that many games in a season again. 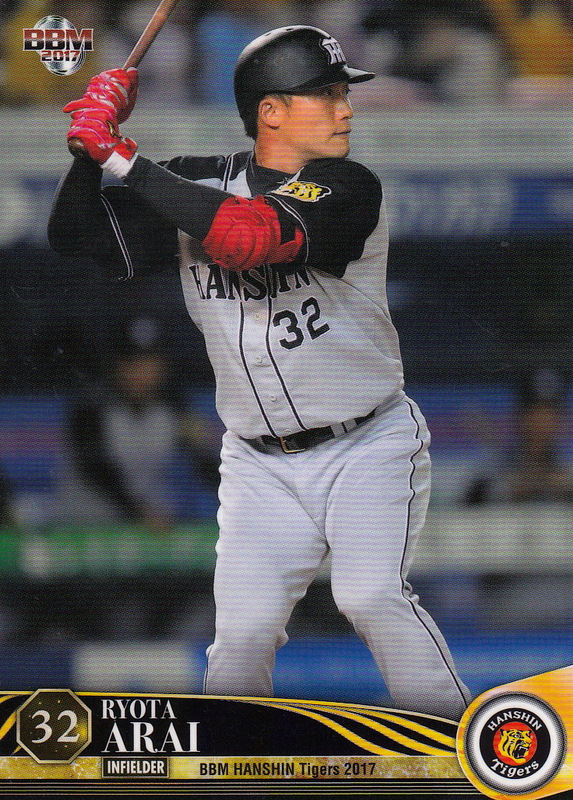 After hitting .252 in 109 games in 2012 (and appearing in that year's Nippon Series), his playing time dropped to 40 games in 2013 and 21 games in 2014. 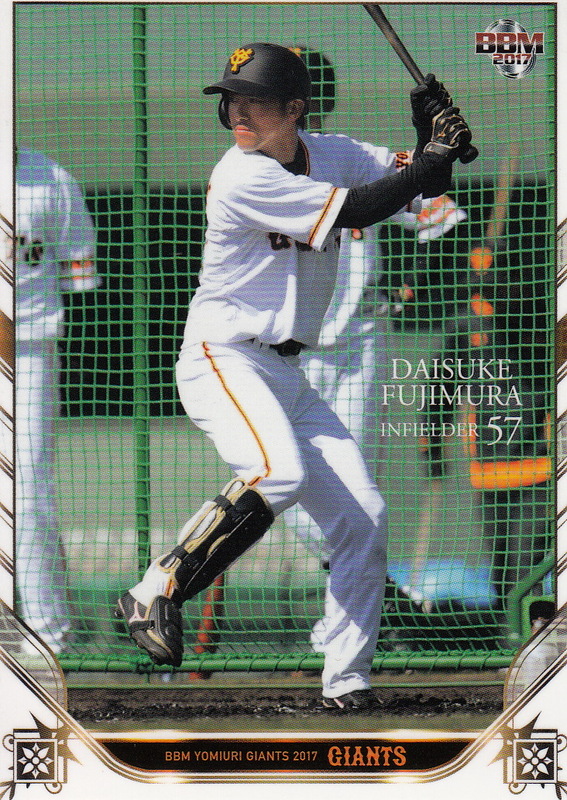 He only got into 5 games at the ichi-gun level in the past three seasons (all in 2016). He's taking an unspecified role in the Giants organization. 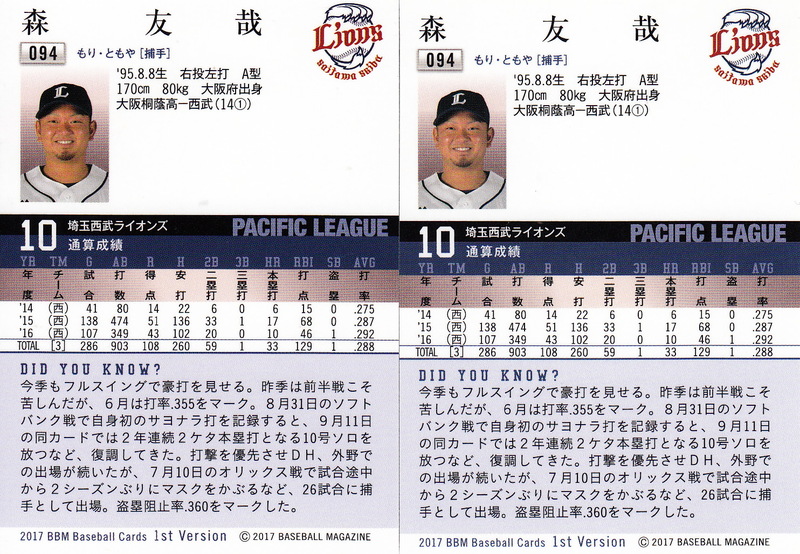 His BBM rookie cards are from the 2008 Rookie Edition (#1) and 1st Version (#031) sets. 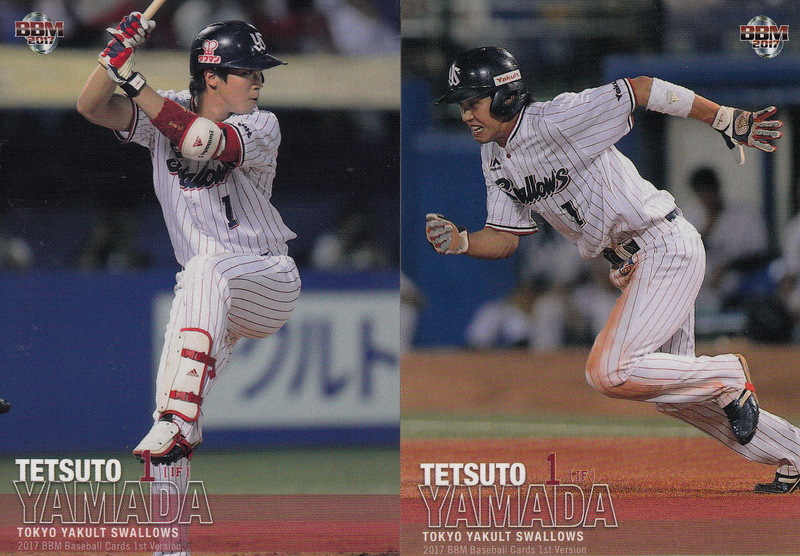 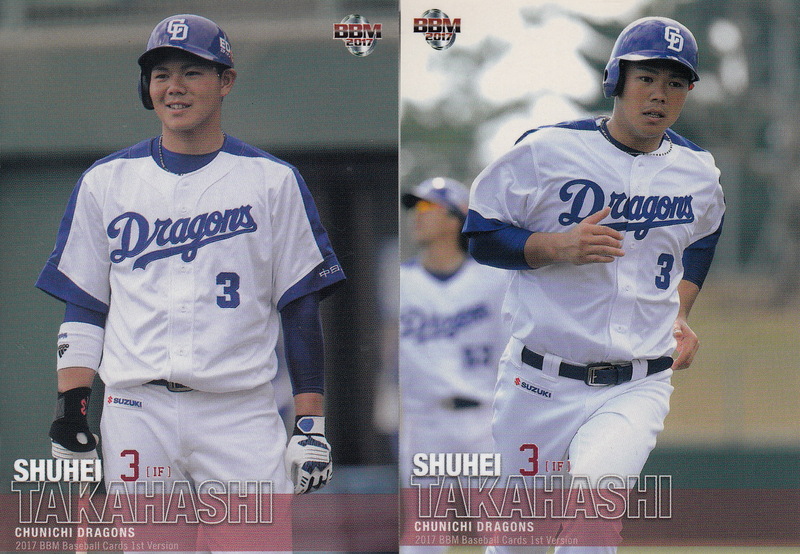 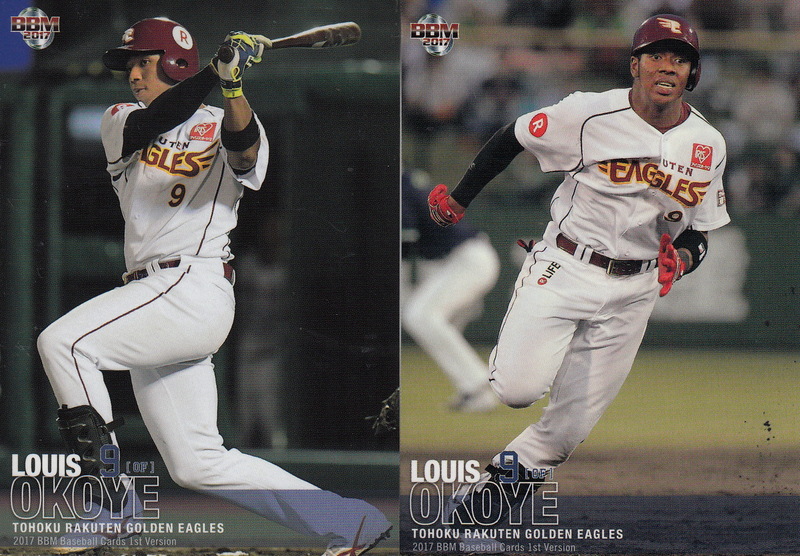 He only had two Calbee cards ever, both from 2012 (#194 and #T-18 from the "Title Holders" subset).